Welcome to the first post in a series of seven on how to optimize Google Analytics (GA) to track your local search engine optimization project. Working with as many “local search” clients as we do it is important for us to get the most information about our local search campaigns as quickly and efficiently as possible from Google Analytics. This series describes a sequence of steps we take to customize and optimize Google Analytics to best serve our needs. You need to use a different URL in your Local Business Center (LBC) listing so that you can track the traffic that comes from your listings. This is also another opportunity to ‘optimize’ your listing further as I typically recommend using the city name you are targeting as the vanity sub-directory. In step 3 we’ll cover the fact that at this point the URL you just made up returns a 404 error since the page doesn’t exist. Now copy the URL that was generated and change the ? to a #. Your URL should look like this. That’s it! If you are not using a web server where you can edit an .htaccess file to place this redirect, check other resources for help on creating 301 redirects. Traditionally URL parameters such as those found in your tracking URL come after a ? in the URL. However we replaced the ? with a # remember? The reason we did this is search engines such as Google don’t consider URLs with # in them as ‘duplicate content’, saving us from any future problems. Now we need to tell Google Analytics about our change so that it can still track our campaign properly as by default it is expecting a ?. To do this, add the line in bold to your current Google Analytics tracking code snippet. Now you are on the Create Advanced Segment screen. Click the traffic sources drop down under the “Dimensions” menu on the left. Drag the ‘Campaign’ box to where it says ‘dimension or metric’ on the left. Leave Condition as “Matches Exactly” and then enter “google-universal-local” as the value. 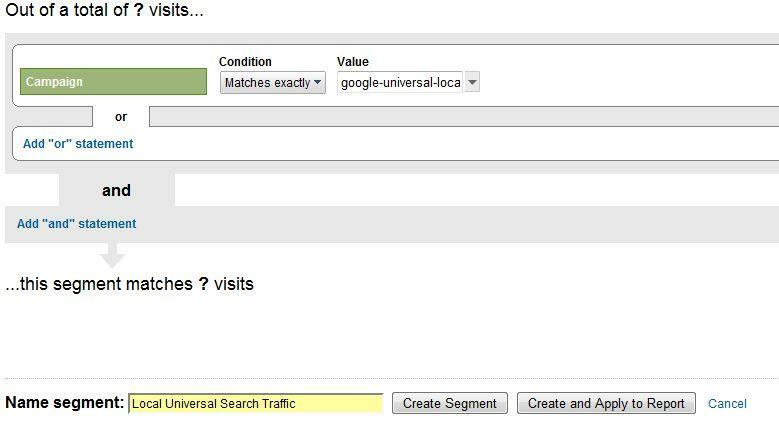 Name the segment towards the bottom ‘Local Universal Search Traffic’ and click ‘Create Segment’. Now that you have an advanced segment established, you can view data for your visitors who belong to this segment right along side the numbers for ‘all visitors’ or any other segment. To do this click on the ‘Beta Advanced Segments’ box again then place a check mark next to your new Custom Segment and click apply. You’ll notice the keywords people used to find your local Google Universal Search listings don’t show up in the Traffic Sources -> Keywords report. You can find the keywords that were used by going to Traffic Sources -> Campaigns -> google-universal-local and then choosing the ‘Keyword’ dimension from the drop-down. Thanks for sticking with this somewhat detailed and technical post. In the next installment we’ll discuss how to take a deeper look at what visitors from your ‘region’ or at least the regions you are most interested in are doing on your site. *Disclaimer – by following the steps above you will not only be collecting data on visitors from Google’s Local Universal Search results, but you will also be tracking visitors directly from Google maps as well. In our experience most of the traffic comes from the GUS results and not Google Maps, but proceed at your own risk. If your local business is not ranking well in Google’s local ‘ten-pack’ when someone is searching for the products or services you offer in your area, you may be missing out on hundreds of customers or more each month. Yahoo Local and other local directories are also very important sites on which to have presence. Learn more! This sounds fantastic and I plan on testing it, but I had a question. If you update your URL in the LBC to a landing page that redirects to a tracking URL, will this negatively impact your local listing since your URL will be different across local directories, IYPs, etc? For example, in your Google listing the URL would be example.com/xyz, but in the local directories and IYPs the URL listed would be just example.com (without the landing page). I’m wondering if this will negatively impact local rankings or cause Google to lower their “trust” in your listing since it differs from other sources….or is Google mainly concerned with just company name, address & phone number (NAP)? We have not seen any negative effect from having a slightly different URL in the listing. Since some listings don’t even have URLs I would tend to think this is a very minimal factor if at all. Good luck! This is a great and informative tutorial but I have to ask, isnt there an easier way to do this? If you own your listing you can now get results from there as well, and I do believe GA shows results from maps as referrer site under Google… ? not that i know of, Sure you can get some information from the reports in the LBC, but they only show click-throughs to your website and not what happens after they get there. I’m a little new at this, but it looks like it’s all working. Thanks for the post, it’s extremely important to prove to the client that what we do is measurable! Thanks for the tutorial. With blended search and universal search, that becomes really relevant to track incoming from segments. I’m just wonderring why do not use directly the Analytics in the Google local business URL ? Hi Patrice, I am not quite sure what you are suggesting. Perhaps the data made available in the Google Place Pages Dashboard? That is very good data, but doesn’t show you what happened after a visitor comes to your website. I have been researching this and came across instructions that were much simpler. I hope they work. I got an “under review” when I made the change. interesting, will you please share the link where you found the simpler instructions? Never seen the under review before after doing this dozens of times…. You’re likely seeing the ‘Under Review’ as part of the campaign URL features the word ‘Google’. Great post. Followed steps 1, 2 & 3, which were pretty straight forward. There is a question though regarding the Traditional vs the Asynchronous codes. We are currently using the Traditional GA tracking code which is similar to your snippet minus the following deprecated line: pageTracker._initData();. I am considering replacing the Traditional with the new Asynchronous code and splitting it between the Head and bottom of the page to help with page rendering. Does the pageTracker._setAllowAnchor(true); line need to be added to the Asynchronous version and if so should it follow the _gaq.push([‘_setAccount’, ‘UA-XXXXXXX-X’]); line or should it be located elsewhere? Wait a sec. Back up. Mike – you’ve added the GA utm code to urls on GLL “dozens of times” & never had a problem? Or do you mean you’ve done the extremely-complex-and-no-way-I-am-gonna-spend-the-time-to-get-the-client’s-webdev-dude-into-this-anyway method? If the former then that’s very interesting! I tried it & got the “under review” for a week, whereupon I killed it. Not to mention it sure looked ugly for that week. Is there anything special you did? And hey, Orlando Logo Dude, howzabout that link? Nope I really have done it dozens of times with no issue. Are you sure your under review status wasn’t for something else? also why did it look ugly? seems like you didn’t use the vanity URL in your listing maybe? I tried it and it works, but only partially because Google doesn’t use the “vanity url” when the listing appears in universal search 10 pack. Only on the google maps pages wil google send the visitor to yourbusinues.com/xyz. Google has changed in the last few weeks and now in many cases they are using the URL from their organic index not the one supplied in Google Places. We are working on a work around, but nothing for now.